Most modern SSDs include onboard DRAM, typically in a ratio of 1GB RAM per 1TB of NAND flash memory. This RAM is usually dedicated to tracking where each logical block address is physically stored on the NAND flash—information that changes with every write operation due to the wear leveling that flash memory requires. This information must also be consulted in order to complete any read operation. The standard DRAM to NAND ratio provides enough RAM for the SSD controller to use a simple and fast lookup table instead of more complicated data structures. This greatly reduces the work the SSD controller needs to do to handle IO operations, and is key to offering consistent performance. SSDs that omit this DRAM can be cheaper and smaller, but because they can only store their mapping tables in the flash memory instead of much faster DRAM, there's a substantial performance penalty. In the worst case, read latency is doubled as potentially every read request from the host first requires a NAND flash read to look up the logical to physical address mapping, then a second read to actually fetch the requested data. Caching is of course one of the most famously difficult problems in computer science and none of the SSD controller vendors are eager to share exactly how their HMB-enabled controllers and firmware use the host DRAM they are given, but it's safe to assume the caching strategies focus on retaining the most recently and heavily used mapping information. Areas of the drive that are accessed repeatedly will have read latencies similar to that of mainstream drives, while data that hasn't been touched in a while will be accessed with performance resembling that of traditional DRAMless SSDs. SSD controllers do have some memory built in to the controller itself, but usually not enough to allow a significant portion of NAND mapping tables to be cached. For example, the Marvell 88SS1093 Eldora high-end NVMe SSD controller has numerous on-chip buffers with capacities in the kilobyte range and aggregate capacity of less than 1MB. Some SSD vendors have hinted that their controllers have significantly more on-board memory—Western Digital says this is why their SN520 NVMe SSD doesn't use HMB, but they declined to say how much memory is on that controller. We've also seen some other drives in recent years that don't fall clearly into the DRAMless category or the 1GB per TB ratio. The Toshiba OCZ VX500 uses a 256MB DRAM part for the 1TB model, but the smaller capacity drives rely just on the memory built in to the controller (and of course, Toshiba didn't disclose the details of that controller architecture). The Toshiba RC100 requests a block of 38 MB of host DRAM from the operating system. The OS could provide more or less than the drive's preferred amount, and if the RC100 gets less than 10MB it will give up on trying to use HMB at all. Both the Linux and Windows NMVe drivers expose some settings for the HMB feature, allowing us to test the RC100 with HMB enabled and disabled. In theory, we could also test with varying amounts of host memory allocated to the SSD, but that would be a fairly time-consuming exercise and would not reflect any real-world use cases, because the driver settings in question are so obscure and not worth changing from their defaults. We can see the effects of the HMB cache quite clearly by measuring random read performance while increasing the test's working set—the amount of data that's actively being accessed. When all of the random reads are coming from the same 1GB range, the RC100 performs much better than when the random reads span the entire drive. There's a sharp drop in performance when the working set approaches 32GB. 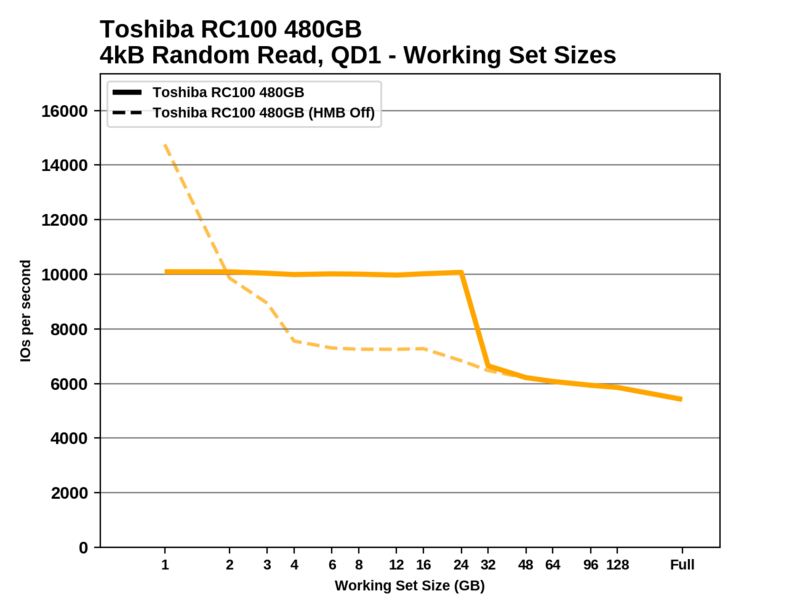 When the RC100 is tested with HMB off, performance is just as good for a 1GB working set (and actually substantially better on the 480GB model), but larger working sets are almost as slow as the full-span random reads. It looks like the RC100's controller may have about 1MB of built-in memory that is much faster than accessing host DRAM over the PCIe link. Most mainstream SSDs offer nearly the same random read performance regardless of the working set size, though performance through this test varies some due to other factors (eg. thermal throttling). The drives using the Phison E7 and E8 NVMe controllers are a notable exception, with significant performance falloff as the working set grows, despite these drives being equipped with ample onboard DRAM. I'm not sure how interest explains why you've reviewed this two days after it shipped but 7 weeks after you posted the 970 Evo review, there is no 970 pro review. Every other inferior review website posted the pro and evo reviews simultaneously, so Samsung must have sent you both drives around the same time. They're usually very late with most reviews. Except Intel ones. You already know a bazillion other sources for a 970 Evo review, so you're beating this guy up for being different? He says doing this review is more interesting for him, so no wonder he did it. I was saying every other review site was inferior, yet they posted 970 PRO reviews the same time as 970 EVO reviews. My issue with Anandtech was the sole posting of the 970 EVO review and no 970 PRO review now for over 7 weeks.